Just about everyone has enjoyed the flavor of vanilla, but many are not aware where this delightful taste comes from. 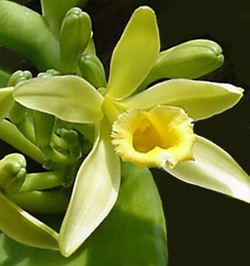 Vanilla is actually a genus of about 110 species in the orchid family (Orchidaceae) native to tropical and subtropical areas of Central America, Asia, New Guinea and West Africa. The flavoring we use is derived from the seed pods of a few of these plants, primarily V. planifolia (=V. fragrans). This species from wet tropical lowland forests of Mexico and Guatemala is now widely grown throughout the tropics; Madagascar and Indonesia are the world’s leading producers. Other species grown commercially include V. pompona and V. tahitiensis (thought to be a hybrid of V. planifolia and V. pompona). The Totonac, living on the Gulf Coast of Mexico near present-day Vera Cruz and conquered by the Aztecs in the 15th century, were the first to cultivate this orchid for its fruits. When Spanish explorers arrived on the Gulf Coast of Mexico in the early 16th century they called the plants vainilla (“little pod”). Vanilla beans the processed seed pods. Mexico was the main producer of vanilla until the mid-19th century when the crop was introduced to the island of Réunion, and from there to the Comoros Islands and Madagascar. Vanilla from Réunion and Madagascar is often called Bourbon vanilla (in the early 19th century Réunion and the Comoros were called the Bourbon Islands) but is from the same plant as Mexican vanilla. The distinctive flavor called vanilla comes primarily from the compound vanillin (4-hydroxy-3-methoxybenzaldehyde) which is found only in the fruit or seed pod of vanilla orchids. 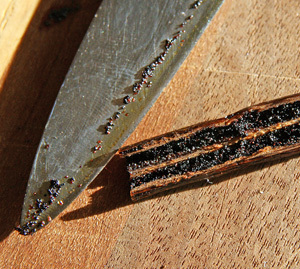 There are as many as 130 other aroma components in vanilla extract that contribute to the aroma. V. planifolia has a higher concentration of vanillin than other species, which is why it is the predominant type grown commercially. Because vanilla is so expensive to produce, synthetics are often used instead of natural vanilla. Artificial vanilla flavor is a solution of synthetic vanillin in ethanol, but without all the other minor components of real vanilla that provides its complexity of flavor. This compound is easily produced from wood wastes of the paper industry. Tiny black seeds fill the beans. A large percentage of the world’s vanilla is used in ice cream, yogurt and other commercial dairy products. The tiny black seeds are often seen in quality ice creams that use real vanilla beans for their flavor. In addition to being a favorite flavor in foods and beverages, it is also used in perfumes, for flavoring medicines and in industrial applications to mask strong odors. 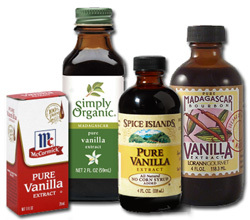 In home kitchens vanilla is used almost exclusively in sweet, rather than savory, dishes. Vanilla is and essential ingredient in many cookies, cakes, puddings and pastries. The evergreen V. planifolia grows as a rambling perennial herbaceous vine, climbing up trees in its native environment as an understory plant, or on poles or other supports in plantations. Long, whitish adventitious roots produced opposite the leaves at nodes along the vine anchor the plant to its support. The long, cylindrical, dark green branching stems are succulent but brittle. Flat, fleshy, oblong-elliptic to lanceolate leaves are produced alternately along the stem. Although the vines will grow up to 75 feet high, in plantations they are trained to a convenient height for hand pollination and harvesting. Plants are vegetatively propagated from stem cuttings. Vine sections with 6 or more nodes are stuck into loose soil, with the lower two nodes buried, and the remainder exposed and placed near a support. Roots growing from each node will attach to the pole or other tree as growth resumes. Fragrant flowers are produced annually (generally April and May in Mexico; November through January in Madagascar) in clusters of 6-15 or more, with the axillary inflorescences produced at the top of the vine. The flowers open from the base upwards, usually with one or two flowers opening at a time beginning early in the morning, and each 5″ flower lasting for about one day. The waxy, pale greenish yellow flowers are not particularly spectacular like many orchid flowers. The lower petal is modified into a trumpet-shaped, three lobed lip, with the upper petals resembling sepals. 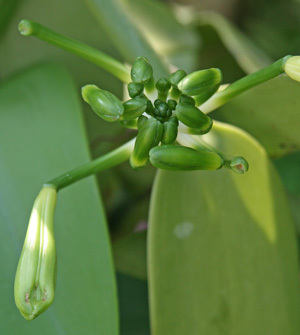 In its native habitat, vanilla orchid flowers are pollinated by stingless bees of the genus Melapona (and possibly by hummingbirds). Because these bees have not been successfully cultured to be moved to other areas, the only way to produce fruit outside of its native area is by artificial pollination. In 1841 a 12-year old slave on Réunion devised a method of hand pollination that is still used today. A beveled sliver of bamboo (or similar instrument) is used to fold back the membrane separating the anther and the stigma, and by pressing the anther on the stigma the flower is self-pollinated. Each pollinated flower produces a fruit or seed pod. The pendulous, fleshy, nearly cylindrical elongate pods – called beans, and resembling big green beans – are filled with thousands of tiny black seeds. Typically 4-8 pods are allowed to develop from each inflorescence. The pods are harvested when fully grown but not ripe (when the tips become yellow), about 8-9 months after flowering. These fresh vanilla pods do not have any taste because the vanillin is bound as a glycoside and must be released by enzymatic reaction. To accomplish this, the beans are processed by a variety of methods, including heating in the sun, ovens or hot water, or freezing, then are then held under hot and humid conditions (115º-150ºF) to allow the natural flavor to develop. The cured pods are then dried to 25-30% moisture to complete the curing process and retain their aroma. Vanilla extract is made by soaking cured vanilla beans in ethanol. 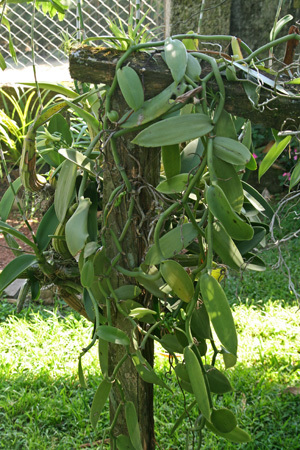 Outside the tropics vanilla vines can be grown as indoor or greenhouse plants – generally more as a curiosity than for its flowers or to produce seed pods, as the plants won’t flower until they are at least 10 feet long, under optimal conditions. They need care similar to other orchids – bright light, moderate to high relative humidity – but require much more space to grow large enough to bloom. I did not know the vanilla bean was from an orchid. It would be fun to try to grow this unfortunately but it sounds like it needs a lot of space.